COMSTOCK, Mich.—A new seasonal release, Hopslam mini-kegs and the return of The Oracle – just a sample of the incredible lineup Bell’s Brewery has in store for fans in 2018. Specialty beers will include a canning line debut, a new series and a special version of a Bell’s classic. Year-round favorites Two Hearted, Amber, Oarsman, Oatsmobile, Porter, Kalamazoo Stout and Lager of the Lakes will all return. 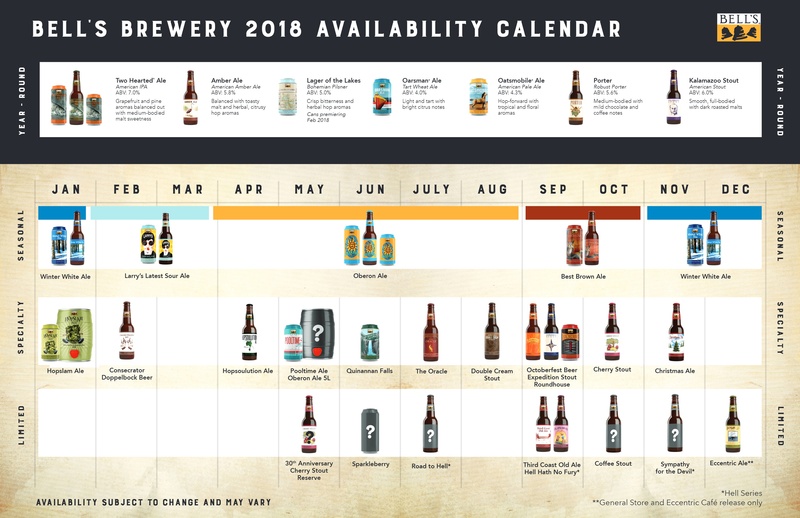 Bell’s seasonal calendar will again feature Oberon, Best Brown and Winter White. As previously announced, Larry’s Latest Sour Ale will debut early next year subbing in for Smitten Golden Rye Ale. Oberon fans take note, next year’s release day is set for March 26. Another exciting addition for 2018 will be the debut of Lager of the Lakes in 12 oz. cans, packaged in 6packs. Bottles will be officially retired as a packaging option. Lager cans will also start shipping in February. “With seven year-rounds, four seasonals and more than a dozen specialties, it’s going to be another amazing year of Bell’s beer,” Laura Bell, CEO of Bell’s Brewery, said. “We will continue to push the boundaries and celebrate what makes Bell’s unique and innovative,” she said. “As with this year’s release calendar, we still reserve the right to announce a few surprises here and there,” she hinted. In all, at least four new Bell’s beers will debut next year. As part of that, a new series will also come to life for the first time. “Hell Hath (No Fury) was always meant to be a trilogy of beers. That dream is finally becoming a reality,” Larry Bell, Bell’s President and Founder, said. Brewed along the lines of a Belgian-inspired stout, Hell Hath No Fury is a Dark Ale that will be released between two new companion beers. Road to Hell will be released first in July, followed by Hell Hath No Fury in September and then Sympathy for the Devil in November. Both additions to the new series will feature label art from southwest Michigan native and celebrated artist, David Coverly. He also illustrated the Hell Hath No Fury and Bell’s Java Stout labels that are still used today. Sparkleberry Ale, a fan favorite since it debuted at Kalamazoo Pride in 2013, will head to the Bell’s canning line for the first time in June. A Belgian-style Tripel brewed with raspberries, Sparkleberry will be released in 16 oz. cans, packaged in 4-packs. Last but not least, another Bell’s milestone will be celebrated in 2018. 30th Anniversary Cherry Stout Reserve will be released in May, commemorating the debut of Bell’s Cherry Stout in 1988. This celebratory beer will be a special version of one of Bell’s signature stouts made with cherry juice sourced from Michigan’s Traverse City region. It is another testament that speaks to the honor of being Michigan’s oldest craft brewery. Additional details will be shared on Bell’s social media and website as they become available. Bell’s beer fans are encouraged to follow Bell’s on Facebook, Twitter, Instagram and Snapchat for the latest news and release info. January: Hopslam (Double IPA) – 12 oz. cans packaged in 6-packs, draught and mini-kegs (5L); Larry’s Latest Sour Ale – 12 oz. bottles packaged in 6-packs and 12-packs, on draught and in 16 oz. cans packaged in 4-packs. February: Consecrator Doppelbock – 12 oz. bottles packaged in 6-packs and on draught. March 26, 2018: Oberon Release Day – American Wheat Ale in 12 oz. bottles packaged in 6-packs and 12-packs, 12 oz. cans packaged in 12-packs, 16 oz. cans packaged in 4-packs and draught. April: Hopsoulution (Double IPA) – 12 oz. bottles packaged in 6-packs and on draught. May: Oberon mini-kegs (5L); Pooltime Ale (Belgian-inspired Wheat Ale made with cherry juice) packaged in 12 oz. cans in 6-packs and on draught; 30th Anniversary Cherry Stout Reserve – 12 oz. bottles packaged in 4-packs and on draught. June: Quinannan Falls (India Pale Lager) – 12 oz. cans packaged in 6-packs and on draught; Sparkleberry Ale – 16 oz. cans packaged in 4-packs and on draught. July: The Oracle (Double IPA) and Road to Hell – 12 oz. bottles packaged in 6-packs and on draught. August: Special Double Cream Stout (Sweet Stout) – 12 oz. bottles packaged in 6-packs and on draught. September: Bell’s Octoberfest Beer (Märzen), Third Coast Old Ale (Barleywine), Expedition Stout (Russian Imperial Stout), Hell Hath No Fury … Ale (Dark Ale) – all 12 oz. bottles packaged in 6-packs and on draught; Roundhouse (India Red Ale) 12 oz. cans packaged in 6-packs and on draught; Best Brown (American Brown Ale) – 12 oz. bottles packaged in 6-packs and 12-packs, on draught and in 16 oz. cans packaged in 4-packs. October: Cherry Stout and a Bell’s coffee stout to be announced at a later date – both in 12 oz. bottles packaged in 6-packs and on draught. November: Christmas Ale (Scotch Ale) and Sympathy for the Devil – both released in 12 oz. bottles packaged in 6-packs and on draught; Winter White (Belgian-inspired Wheat Ale) – 12 oz. bottles packaged in 6-packs and 12-packs, on draught and in 16 oz. cans packaged in 4-packs. December: Eccentric Ale – 12 oz. bottles and on draught (Bell’s General Store and Eccentric Café release only). Bell’s Brewery, Inc. began in 1985 with a quest for better beer and a 15 gallon soup kettle. Since then, we’ve grown into a regional craft brewery that employs more than 500 people over a 32 state area, in addition to Puerto Rico and Washington DC. The dedication to brewing flavorful, unfiltered, quality craft beers that started in 1985 is still with us today. We currently brew over 20 beers for distribution as well as many other small batch beers that are served at our pub in Kalamazoo, the Eccentric Cafe. Our ongoing goal is to brew thoughtfully, creatively and artistically. 100% family-owned and independent, we strive to bring an authentic and pleasant experience to all of our customers through our unique ales and lagers. For more information, please visit bellsbeer.com. You can also follow Bell’s on Facebook, Twitter, Instagram, Snapchat and Untappd. When are you having the bourbon barrel/barrel aged release? October 2018?